Every office comes with its own dress code, but in today’s day and age, the idea of “business casual” has become more fluid than ever, especially if you work in a more relaxed environment. And when you work in a creative industry, it’s easy to fall into a pattern of casual work outfits starring your everyday jeans-and-blouse ensemble. That’s why today we’re here to challenge you to think a tad more out of the box when it comes to low-lift office looks. When you find yourself in a sartorial rut, the easiest way is to fill yourself with endless inspiration. So we took it upon ourselves to find the most stylish outfits you can wear to work and even a happy hour afterward. 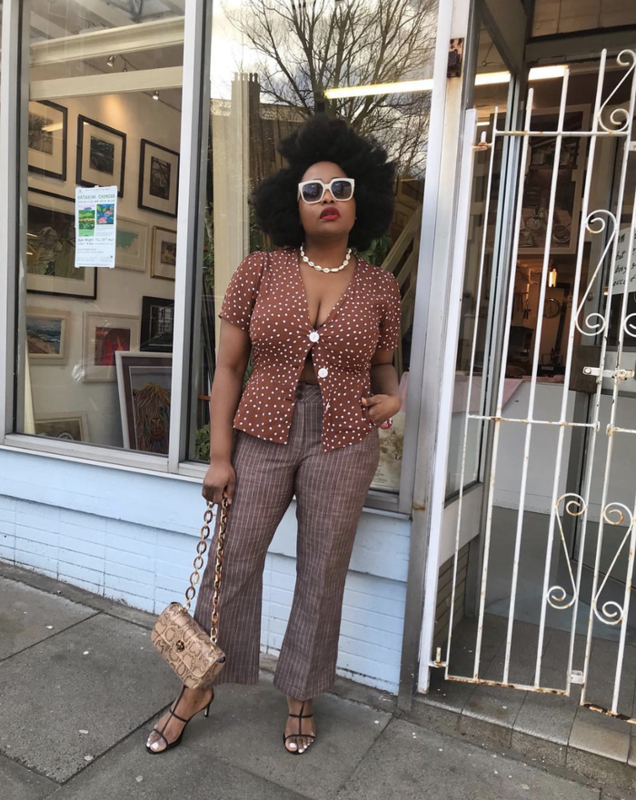 From easy outfits that only require a blazer to give the finishing touch to unexpected styling tips, let these girls give you a starting point as you begin to build your work ensembles. Ready to give your work wardrobe an upgrade for the spring? See all of these chic looks below. Style Tip: Mix and match cool prints in tonal hues for a fun play on monochromatic dressing. Style this floral blouse with your favorite jeans or a pair of trousers. Pinstripes always show that you mean business. Style Tip: Elevate your blazer and jeans ensemble with a pair of classic heels. Without making too much of a statement, this blazer will ensure you stand out in the office. Wear these jeans to the office for your more casual days and on the weekend. Style Tip: Now that it’s spring, you can start wearing shorter skirts again. For a streamlined approach, keep the shades tonal. A lightweight, fine-knit sweater like this will feel cozy enough to layer over your outfits until the weather officially warms up. The belt gives this skirt a more trendy touch. Style Tip: Pair a cool and unique version of a button-down shirt with timeless trousers. Nanushka always knows how to make quality faux-leather pieces. These pants are simply so flattering. Style Tip: You can style a robe over a pair of wide-leg jeans for a cool and unexpected way to wear loungewear outside the house. You can wear this silk-satin robe in and out of the bedroom. You won’t be able to stop wearing these cool wide-leg jeans. Style Tip: Layer a button-down shirt underneath a graphic tee for a cool and unexpected approach to business casual. We love a cool graphic tee. Trust us, you’ll get so much wear out of this shirt. Style Tip: Channel the colors of spring with a bright top paired with a floral pants. Wearing this vibrant orange color will easily set you apart from the rest of the office. Pants will feel like the unexpected way to sport the floral print during the spring. Style Tip: A neutral-hued sweater styled with your white jeans will feel both elevated and casual. Subtle texture like small cable knits on a sweater make it so special. You'll fall in love with these white jeans in a heartbeat. Style Tip: You can never go wrong with a light pantsuit paired with a tee and sneakers. You won’t believe how comfortable this tank top is. Everything about these crepe silk pants is gorgeous. Style Tip: A cute puff-sleeve top styled with a pencil skirt will be a foolproof outfit for years to come. The prairie-inspired trend is alive and well, and this top is an easy way to take it on for yourself. You’ll always find a use for this classic black skirt. Style Tip: Give your jeans and blazer a more casual appeal with chunky sneakers. This could be your go-to blazer for all work scenarios. Black jeans at the office feel a touch more polished compared to your denim blues. Now, the secret to walking gracefully in heels, right this way.